The left side Mac-like expandable vertical main navigation is definitely the wrong design decision. I can’t even imagine the amount of vertical scrolling that will be necessary to get to the plugin settings pages if more than say 20 of them are active. The new automatic plugin installer is simply amazing. 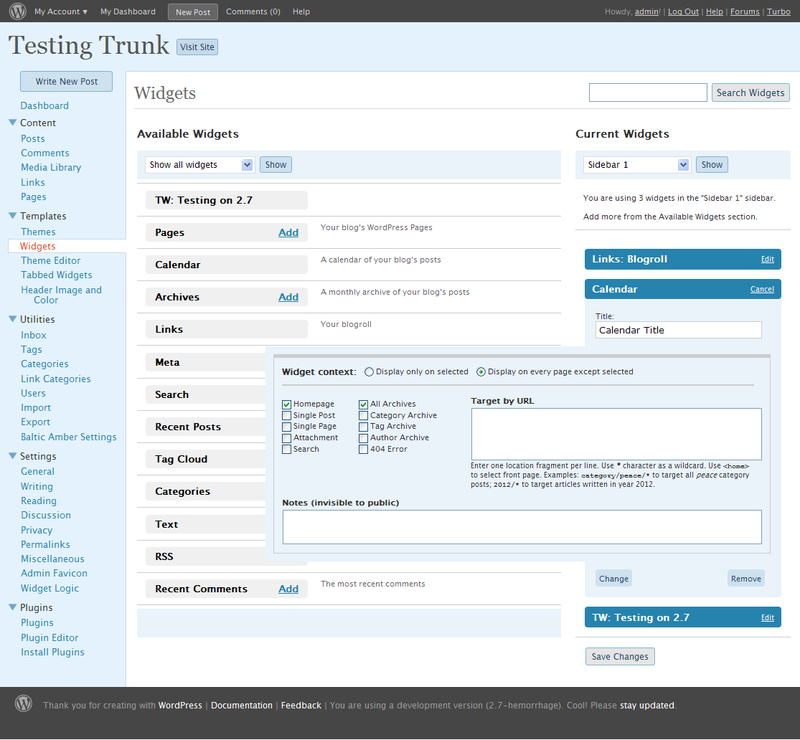 It takes only seconds to find, choose and test new plugins. Theme and Widget settings are now placed under ‘Templates’ menu. The original ‘Design’ definitely makes more sense. Tag and Category management is now under ‘Utilities’, which again is not a good description of the functionality it contains. Link to a new post is placed both in the top navigation bar and also on top of the left side navigation. I think that one would be enough. I should note that every item mentioned above may look and function differently in the final 2.7 release (except the concept of the left side navigation, maybe), and the above feedback is based only on how things look now. On a side note — both Tabbed Widgets and Widget Context plugins work perfectly. I couldn’t agree more about point #1. From the fixed width of the nav, to the point that the subnav items don’t “stay” open as I left them – nor do they seem to follow a logic that I can follow. I think this is definitely a step in the wrong direction. I really wanted to like this design/layout, but it’s just not working for me in daily use. What’s to love? A lot. The fact that I can again reposition elements in the post and page sections – brilliant! So why did it leave in the first place? There’s more of course, but the huge “questionable” changes in the UI is currently my focus. Let’s hope some of it goes back to the way it was. Generally, I like the new version and I believe WordPress developers have listened to our feedback. I like the “automatic plugin installer” which makes life easier. Patrick, indeed — the automatic plugin and core update feature has become one of the most used 2.7 features, together with the ability to reply to comments directly from the dashboard.